John Debney is one of Hollywood’s finest composers and a really super guy to boot. I’ve known him for more than 20 years and his output contains many wonderful scores (as diverse as The Passion of the Christ and The Princess Diaries, not to mention Elf and Dreamer). 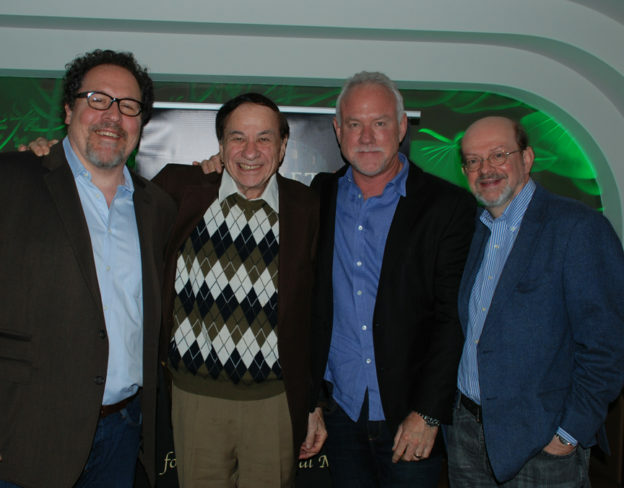 On Monday I was pleased to moderate a discussion about the music of Disney’s The Jungle Book with Debney, original Jungle Book songwriter Richard Sherman, and director Jon Favreau. Debney and Sherman told surprising and funny stories about Debney’s youth, hanging around the Disney lot (his dad worked there) and meeting the famous Sherman Brothers in the mid-1960s. Favreau’s own comments demonstrated a genuine appreciation for Debney’s artistry. The Society of Composers & Lyricists audience was warm and welcoming. This entry was posted in and tagged Disney's The Jungle Book, John Debney, Jon Favreau, Richard Sherman, Society of Composers & Lyricists, The Jungle Book on November 22, 2016 by Jon Burlingame. 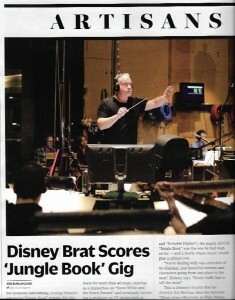 John Debney, the Oscar-nominated composer of The Passion of the Christ and many other scores from Elf to The Princess Diaries, had a dream-come-true assignment recently: scoring Disney’s remake of The Jungle Book. He practically grew up on the Disney lot, was best friends with the boy who voiced Mowgli in the ’67 animated version, and even knew the legendary Sherman Brothers (who wrote most of the songs). His symphonic score for the well-reviewed new film is masterful, and I got to talk with him — as well as director Jon Favreau — in this piece for Variety. This entry was posted in Composers, Film Music, Interviews and tagged Elf, John Debney, Jon Favreau, Richard Sherman, Sherman Brothers, The Jungle Book, The Princess Diaries, Variety on April 6, 2016 by Jon Burlingame.